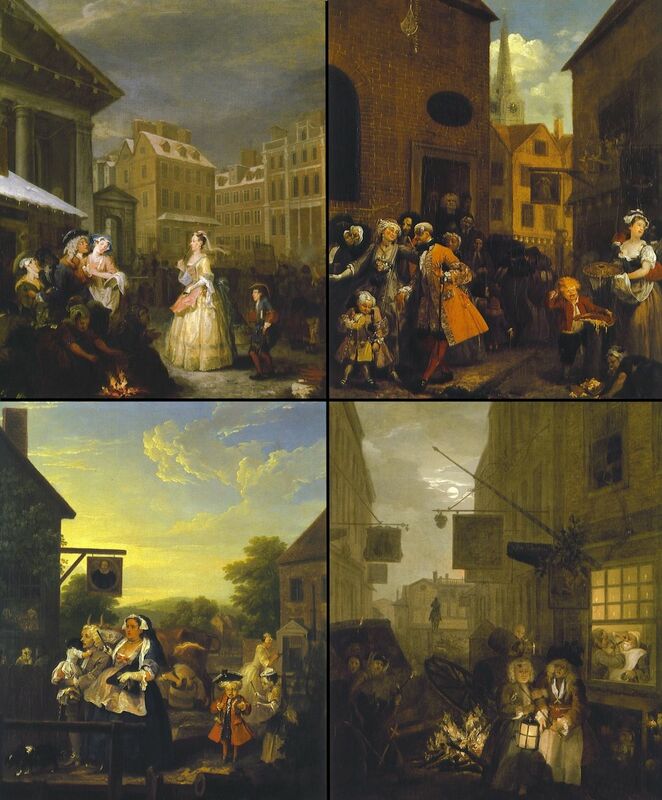 Four Times of the Day is a series of four paintings by English artist William Hogarth. Completed in 1736, they were reproduced as a series of four engravings published in 1738. They are humorous depictions of life in the streets of London, the vagaries of fashion, and the interactions between the rich and poor. Unlike many of Hogarth's other series, such as A Harlot's Progress, A Rake's Progress, Industry and Idleness, and The Four Stages of Cruelty, it does not depict the story of an individual, but instead focuses on the society of the city. Hogarth intended the series to be humorous rather than instructional; the pictures do not offer a judgment on whether the rich or poor are more deserving of the viewer's sympathies: while the upper and middle classes tend to provide the focus for each scene, there are fewer of the moral comparisons seen in some of his other works. I like this work because it depicts the seen of London in the 17th Century and you actually see buildings in London now which still exist since during this period of time when the painting is completed. This artist uses richer colours to make it look closer on things that he used the colour on. he also shows what people do in London during 4 different times of the day : Morning, Afternoon, Evening and Night.